In eight earth years, venus will have orbited the sun 13 times and during those eight years, the Sun, Venus and the Earth will experience five conjunctions where they are all perfectly lined up together. If you draw a line connecting these five conjunctions, guess what design you get? Look at the order, it is the same as the colors in the pentagram, blue = water, white = spirit, red = blood. Another amazing connection to Jesus Christ and his divine mission. But wait! Isn’t an upside-down cross symbolic of evil? Isn’t that an anti-Christ symbol? Perhaps, some use it to convey that meaning, but take a closer look down below at the two figures. I suspect that both represent the apostle Peter; the left figure is him as a fisherman and the right figure is him holding what may be the “keys to the kingdom” along with bread, possibly, in his hand. The other reason I believe it is Peter has to do with the upside-down cross. It is said that Peter was martyred by being crucified upside-down because he did not feel worthy to die in the same way as his Master. So upside-down doesn’t necessarily mean “evil” it just might signify an alternate meaning that we might have to dig a little deeper to understand. The pentagram was a symbol of good for millennia and was even used as a symbol of Christianity before the cross came along in reference to the five wounds of Christ, look it up. 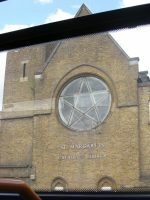 Here’s a small sampling of examples where the pentagram is used on various Christian churches, both right side up and upside down. So if it has been used for so long as a Christian symbol, when this association with evil occur? Believe it or not, the pentagram’s association with evil comes from the opinions of one man in the mid-1800s. A man named Eliphas Lévi, who was once studying to enter the Roman Catholic priesthood, published a book In 1855 called “Transcendental Magic”. He was the first person to declare that an upside-down pentagram meant evil while a right-side-up pentagram meant good. Those in the occult successfully hijacked the symbol and unfortunately the blemish placed upon it still remains. Note that on 6 April 1841, the cornerstone of the Nauvoo temple was dedicated. 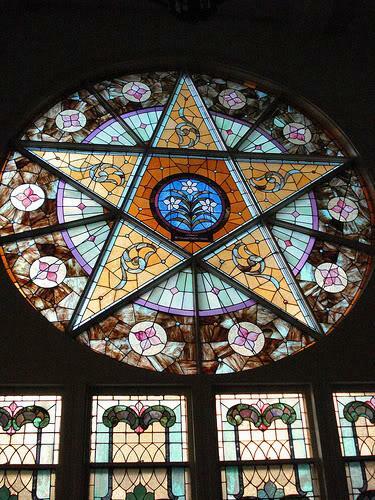 The decision to incorporate pentagrams into the Nauvoo temple pre-dates the publication of Eliphas Lévi’s “Transcendental Magic” and subsequent connection of this symbol to evil by fourteen years. 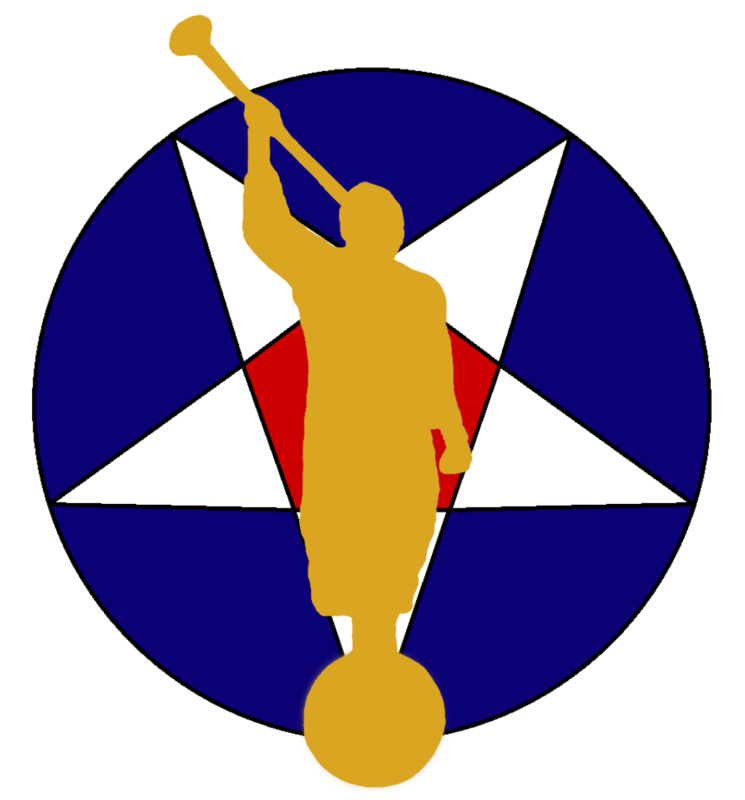 In LDS symbology, I believe that the reason we turn the pentagram upside-down is to distinguish it from an upright star which has a different meaning. I believe when we turn a star upside-down it is to represent a planet instead of a star, the downward point indicates the reflection of light from the sun to the earth. A planet does not produce it’s own light, it reflects it from a brighter source, much like Christ reflected the love from the Father to us. Take a look at the photo of the Nauvoo temple stars again and pay attention to the one on the right. Note the elongated point, extending down toward the earth, this star is also representative of Venus reflecting its light down to a terrestrial plane indicating also the condescension of Christ. Interestingly, the city of Nauvoo was actually named “Venus” for a couple of years. [source] The more you dig, the more interesting the story becomes. To judge a symbol out of context is to not understand it and we fear what we do not understand. The Church of Jesus Christ of Latter-day Saints believes strongly in the idea of “restoration” or putting things back in their proper place and context. The pentagram was once an ancient Christian symbol that has only recently been hijacked; I’m glad to see the LDS Church standing by the pentagram and displaying it in a context which reveals its meaning in truth. It’s time to welcome the pentagram back to Christianity where it belongs. Fabulous post — I never thought about the pentagram. And we use it to represent each of our 50 states on our flag. So, we have the Pentagon in Washington DC — probably Masonic, like a lot of other things there, but having it be associated with war decisions is a little disturbing. Perhaps the original builders had in mind conquering evil. I love temple symbolism. I wish we incorporated more symbols on our modern-day temples. The Masons are only contemporary borrowers of symbols and archetypes that go back to the beginning and are a part of the fabric of the observable universe. As far as incorporating more symbols on modern temples, your wish has already come to pass. 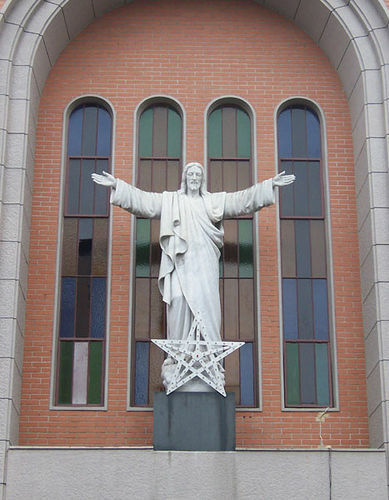 In 1989 the church began to incorporate celestial symbolism back on the outside of temples beginning with the Las Vegas and Portland Oregon temples. It was at the suggestion of temple architect Keith Stepan that Gordon B. Hinckley approved this reintroduction. From that time, our temples have reincorporated the types of outer symbols that before had adorned temples like Nauvoo and Salt Lake. Prior to Christianity the pentagram was a symbol used by the pythagoreans of Greece. It dates back further than that but information escapes me. However the Pentagram was used by the Catholic church to represent the five wounds of Christ which was only one of its respsentations. Yep, you’re right. It is interesting how labels “stick” to various things, it can be both good and bad. People seem to think that just because one thing is associated with another thing that it must have always been that way. The power behind symbols is that they are hard to forget, they almost brand themselves into our minds, especially when we associate them with something we feel passionate about – good or bad. It’s hard to redefine those associations. I’m not sure, some have speculated that the “star” of Bethlehem was a planetary conjunction between Venus, Mars and Jupiter, but I think they understood the difference between stars and planets. It’s possible the star wasn’t star at all, maybe it was some sort of heavenly manifestation discernable only to a particular people. It was called a “new” star, so perhaps it was a supernova that lasted a considerable time. I think the problem with such explanations/interpretations is that they are often not sufficient and rather shallow. In my opinion, its true meaning always should be considered on a much deeper spiritual level, and in the Gnostic context. So, for example a Pentagram symbol represents the Spirit chained to matter remembering its Divine origin. The dualism Spirit-matter as specifically found in the authentic esoteric Traditions like so-called Gnosticism and Manichaeism. Liberation/Salvation of the Spirit from corruptible matter/flesh. Thanks for adding to the conversation. I agree with you that you can go infinitely deep with these kinds of things which makes the subject all the more interesting. My explanations above are fairly shallow but are still much deeper than the average person who might just look at a symbol from an extremely shallow good or evil paradigm. My effort here with this article is to help take someone from that ‘so shallow it’s practically dry land’ point of view a little deeper so that they might see that there is more going on than they might realize. Note that I don’t delve very deep in to the variety of meanings related to the pentagram, I’m mostly just using this particular symbol as an example. Clearly, you are not the intended audience for this article as you are coming from a place where you already understand the depths of such things and a specific view of this symbol from a Gnostic context. Have you ever written a piece based on your understanding of the pentagram in light of the aforementioned traditions? I’d love to see some of your research and conclusions, feel free to use the contact form on this site to reach out to me if you’d like. Your forgetting that both Jesus and Lucifer are considered the “Morning Star” in the bible. They are also both represented by a lion. Jesus is King, the lion. Satan devours like a lion. To me, a right-side up pentagram would represent Jesus, an inverted one would represent the opposite.Why would Satan associate himself with holy symbols. 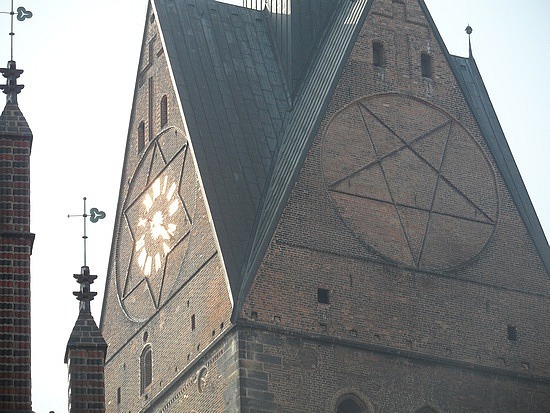 Satanic churches associate themselves with inverted symbols for a reason. You are correct about the dual morning star usage. While Lucifer means “brightness” in the sense of perhaps the morning star, Jesus, via John calls himself the “morning star” as well. Peter also speaks of the “day star” arising in your heart. These are allusions to the planet Venus without much of an explanation in the text, it seems there were cultural correlations that were more obvious anciently. You’re also correct about how symbols have dual usage, you mention the lion, there’s also the serpent (Eden vs. Moses’ brazen serpent vs. Jesus’ telling apostles to be as wise as serpents). The exact same symbol can represent opposite ideas depending on the context. Inverting a symbol may represent the “opposite” or it may just convey “difference” an important difference. You mentioned the inverted “St. Peter’s” cross used in Catholic symbology. Inverting the cross is not anti-Christian but evokes the memory of St. Peter’s martyrdom. When used by the pope, it helps to establish papal authority which the current pope traces back to Christ via Peter. To me, it is no more different or distracting than the Moroni atop the temples. They are both telling stories, just like the scriptures. Note that all of the scriptures are not specifically about Jesus, most of scripture deals with people who have experiences that illustrate certain principles and when they are all considered together, a master tapestry of God’s dealings with man are visualized. So inversion is not always opposition. Val Brinkerhoff’s book “The Day Star” addresses the inverted pentagrams on the Nauvoo temple in more detail than in any other source I have read. The Navuoo temple is covered with many, many stars. There are 5-pointed stars and 6-pointed stars, and based on his research, he notes that 6-pointed stars probably represent real stars out in the cosmos, while the 5-pointed stars (5 being the number of life in connection to man with his five parts, head, arms, legs) represent people and in this case, the hosts of heaven (potentially past and/or future). Now if you wanted to convey Christ among those hosts of heaven, how would you do that, how do you create a different star? Well, the planet Venus which already has connections to Christ looks like any other star (minus the twinkle) but how do you convey that in architecture? Note that there are two kinds of inverted stars on the Navuoo temple, one in stone (all other stars are stone), the other in stained glass. The Christ star’s point is facing down toward a sun stone and is elongated slightly; this is a different kind of celestial body, it is potentially Venus reflecting or drawing it’s light from the sun that it is placed right above. Inverting the star gives it a different meaning. In between these stone Venus stars, we have another inverted star, this one is clearly a pentagram because of the crossing lines and circular frame. Now with this symbol we know we are talking about Venus because of the many ancient associations with the planet Venus that this symbol has. This motif serves a different purpose than the stone Venus stars, it’s telling a different story. You have a central star on the same line as the Venus stars, inverted in the same way, so that’s a clue that there is a shared relationship there (which might not be there if one or the other was facing point-up) they are both Venus. 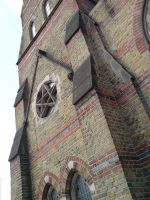 The pentagram star is surrounded by 12 keystone-like blocks which could represent the 12 apostles or the 12 tribes of Israel being gathered to Christ. The temple also features a baptismal font on the back of 12 oxen facing north, east, south, and west. The symbolism is the same, Christ in the center of 12. Another clue is that the star features a curious blue back field, with white points, and red center; in that order going from outside to inside the design. This pattern reminded me of a particular verse found in Moses 6:60 which happens to be a favorite of mine and I can’t help but think that there is a direct, intentional correlation there. It says, “For by the WATER [blue] ye keep the commandment; by the SPIRIT [white] ye are justified, and by the BLOOD [red] ye are sanctified;” The exact same order is followed in the verse and in the star motif. So in the context of the Nauvoo temple, we see that the “difference” conveyed by inversion has several Christ-centered parallels. In this case, the inversion works best for the motif and if the stars were right-side up (especially the stone stars) you lose the difference and some meaning gets lost in sameness. Just as it would be harder to tell a St. Peter’s cross from Jesus’ cross if both were right side up. You could put a “P” on the St. Peter’s cross or a “V” on the Venus star, but it’s more elegant and striking to simply invert them. Sure, you risk confusing many people, but Christ didn’t seem to care much about that when teaching his parables. It was offensive to Jews to have the hero of the “Good Samaritan” parable to be passed by a priest and Levite only to be saved by a Samaritan. If you consider the other parables and symbolic teachings in the Bible, you’ll find other examples. The Chi-Rho symbol is another great symbol and that’s cool that you have chosen that to represent your faith. I’ve chosen the circle within the square, more specifically, a motif I designed to be the logo of this blog that features not only a circle within a square, but done in a manner that intentionally creates a hidden octagon, evoking the often subtle influence of Christ’s mediation that is only apparent to those with eyes to see. So choosing personal symbols is something I am fond of. The reason Satan uses “holy” symbols is because there is nothing else TO use. God did not create a separate alphabet of evil symbols so Satan could spread his lies. Satan is not a creator and does not have the means to insert his own creations inside of God’s. He and his fans can only manipulate what already exists and, ironically, anything they try to do can be turned back around into something that points to Christ. My assertion is that ultimately everything belongs to God and he can use his property any way he wishes despite what his adversaries seek to pervert. In a more recent example of symbol appropriation, rainbows have become ubiquitous with homosexuality and so-called alternative sexual lifestyles when for thousands of years they were representative (and still are) of God’s covenant with Noah and mankind. If God inspires a rainbow-colored temple, I think we would look to more ancient meanings as to what he was trying to communicate than assuming modern twisted meanings apply. I think that goes the same for pentagrams. Their connection with Satanic themes is a recent invention, one that post-dates the construction of the Nauvoo temple. God’s message has never been something so clear and simple that people just “get it” it has always challenged the masses, it has offended them, and compels them to think outside of traditions and pre-conceived notions. This is why his prophets have been stoned and rejected, and labeled as heretics, blasphemers and devils. Jesus himself was condemned and executed as such. So even today, monuments to his work are still misunderstood, derided and marginalized; I suppose it is only fitting. Are we not able to see the patterns repeating themselves? I suppose we all see what we want to see, but as I have tried to see what God sees (I’m not trying to speak arrogantly here) I have seen things differently and in ways that have enriched my soul. Ways that feel higher and more exalted than hasty conclusions based on certain sets of assumptions that feel lacking in information and consideration of scriptural patterns. God places these things in our path to see what we will do. They catch our attention, they stretch us, they challenge us, they disturb and burden the natural man. We are left to feel that we must draw a conclusion and not just pass by without a thought or deep pondering. In pondering, we find the instruction of the Spirit, the influence of the mind of God. The way we see things changes when seen in a new light, a new context. That’s my perspective on the points you raised. I’m grateful that you took the time to share your ideas and that you did so with insight and respect; I hope that my response conveys the same. I can’t recall anything off the top of my head, Val Brinkerhoff’s book called “The Day Star,” named after this symbol on the Nauvoo temple, addresses a lot of the history behind a vast amount of the symbolism around that temple. Every culture/group/religion/government/individual uses the same symbols in different ways. At the end of the day, you’ve got squares, stars, circles, triangles, etc. They’ve been used, reused, recycled, redefined, and reorganized over and over and over again. What matters most is what the people currently using it think about it and what they mean by using it. The way it is used on the Navuoo temple in context with the other celestial bodies seems to connect it more with Venus than anything else. There are plenty of six pointed stars (which represent real stars) and five pointed stars (which represent individuals) and the largest of them is inverted to show that it is different than the other stars. When you look up at the sky, stars and planets look the same, the only difference is that the planets move. So how do you convey that in a building which doesn’t move at all? You simply flip it around to indicate that one star is different than another because it is a planet. That’s one possibility. In the Bible, Christ is referred to as the “Day Star” and Jesus refers to himself as “the Morning Star” both which are references to the planet Venus. Because any references to the pentagram being something associated with Satan came after the Navuoo temple was constructed and Joseph Smith was dead, and the context of the rest of the building, it’s most likely that the pentagrams were intended to be a connection to Jesus by way of the planet Venus (the morning and evening star, beginning and end, alpha and omega, etc). The temple is filled with other major and obscure biblical references as well. I think Joseph stated that the whole Nauvoo temple was meant to symbolize a bride adorned to meet the bridegroom. 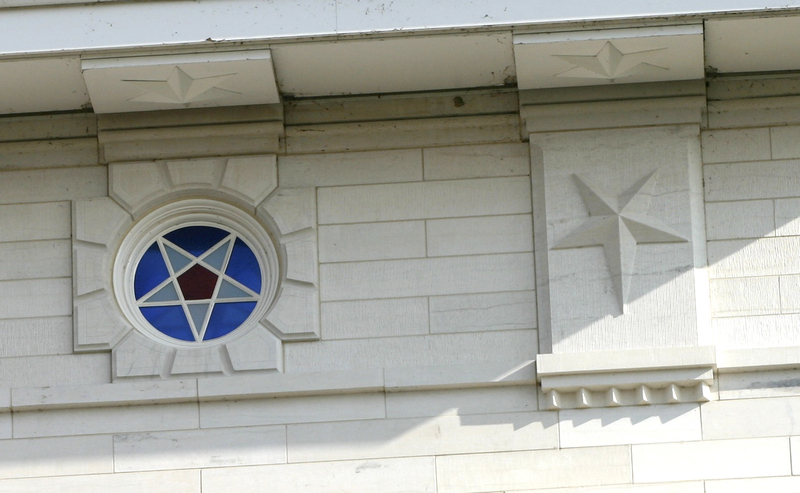 There are two kinds of inverted stars on the Nauvoo temple, one kind is stone, the other is a glass window. The stone stars have an elongated point which extends down toward the sun, perhaps to indicate that it draws or reflects light from the sun which is what a planet does rather than a star which gives off light. It could also represent many other things. By using the inverted pentagram again today on the rebuilt Nauvoo temple, Latter-day Saints have “resurrected” the symbol so to speak (another great reference to Christ) and are using it in a context that directs people to the Savior and his atonement rather than it being a negative symbol. If you think about it, why let Satan co-op everything so he can represent himself? Why not take those things back and direct them towards a good and sacred purpose? I propose that this is exactly what the Latter-day Saints are doing here in this case (and possibly many others). Christians hi-jacked the symbol from pagans first. Think it through, where did the pagans get it? At the end of the day, we are talking about basic geometry. Who is the source of all things and all divine patterns? God is the source of any and all truth, the adversary creates nothing, neither do pagans. Everyone teaches their own ideas with the building blocks that God has already set in place. There was no “pagans first” because they did not originate anything, nor could any mortals. Just because a pagan drew a square once doesn’t mean that he invented squares or owns them because he applied his own meanings to them. The point of this article is to acknowledge that all things have their source in God. Otherwise, we are to believe that we or the adversary have power to create independent truths outside of God’s creation and that somehow we thought of shapes that God had never conceived. God’s people have betrayed and returned to him so many times, that doctrinal debris is scattered everywhere. Many cultures have discovered things on their own, but they only discover them, they don’t own them. I find more value in looking at all things in light of their ultimate source, not through the polluted lens of mankind’s history of tinkering with them. 2. Who were these pagans and where did they get it? The symbol is pre-christian and pantheistic. It originated in ancient Mesopotamia and traveled to Greece. It’s associated with magic and the makeup of our universe. So, yes, it was borrowed. Here are a few feelings I have about this subject. Using the example of Peter’s martyrdom being hung upside down as an example of the GOODNESS of that inverted symbol, is taking that scene out of context. 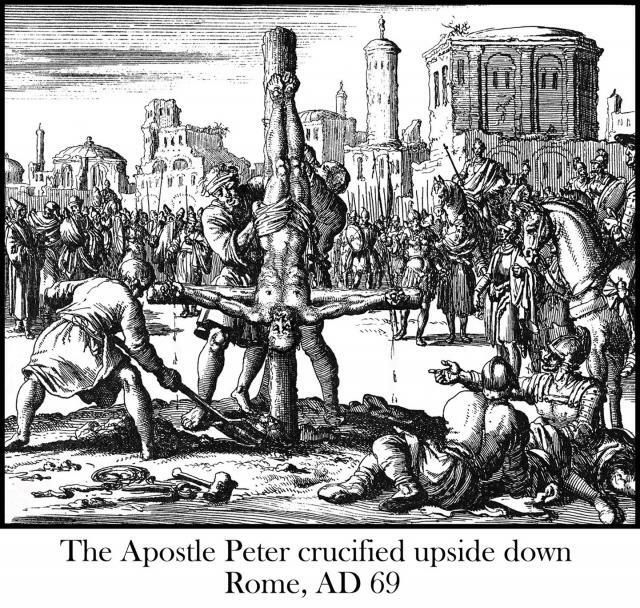 It was Peter himself who proclaimed doing it for the reason that he was “UNWORTHY” to be hung right side up in the manner that Jesus was. This infers an EVIL connotation for this inversion taking place. Not because PETER was being evil for wanting this, but because Peter felt he had DONE evil by being tempted of Satan when he tried to prevent Jesus being taking from the Garden by cutting off the ear of the guard. Jesus told Satan to depart from Peter. If you use the presentation of a symbol serving two OPPOSITE meanings, it must be consistent. Like using the left hand to represent evil, while the right hand represents that which is good. An INVERTED star symbol which has equal length rays is evil no matter how you cut it, and is CLAIMED by witches to be the Devil’s Sign. Why would Christ claim the same INVERTED symbol for HIMSELF ? They were placed on a temple that was DESTROYED by God. He ALLOWED it to take place….Like destroying Sodom and Gemorah. The Saints had FAILED God, like Peter momentarily failed the Lord. That Temple has now been FALSELY RESSURECTED, like Satan will pretend to do as he “Seats himself in the temple of God as though he were God”, as per 2 Thessalonians. The Great Test Kimbal spoke of. Fair enough about Peter, that is definitely something worth taking into consideration on that level. However, in another context, using an inverted cross to reference Peter just as a regular cross is used to reference the Savior is not problematic. A symbol having opposite meanings doesn’t have to be consistent. Men and women can be seen as opposites but that doesn’t mean that one of them is evil. A star shape is not evil in and of itself no matter which direction it “points.” It’s a geometric shape. It can be used to communicate good or bad things but at the end of the day it’s a shape. The symbol of a star in a circle has been used for millennia in connection with the planet Venus. It was used as a sign for good luck for centuries among Christians and it wasn’t until the 1850s that a man named Eliaphis Levi decided to connect it with a sign of excommunication and potential ties to the devil. Those were new inventions made by man. Just because some man or some witches claim something for themselves doesn’t mean they get to change the meaning of they symbol. Jesus is connected with the planet Venus by Peter who mentions the “day star” (2 Peter 1:19) arising in people’s hearts and by, well, Jesus, who calls himself the “bright and morning star.” (Rev 22:16). The use of heavenly bodies to represent deity is a thing. The use of symbols is simply another way of telling a story, but you have to get the context right; otherwise, you get another story. If that’s the case, then God was using a symbol for the LBGT movement with Noah after the flood. You might want to look into this too, but I don’t think the original Nauvoo temple had the inverted star windows. 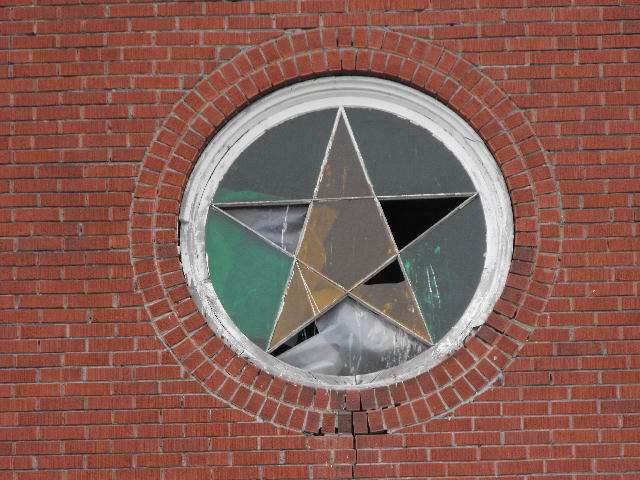 I think they were sunburst windows but the plans called for the star windows. The new temple used the star windows to try and be true to the original design. Note that when these plans were made, it was 14 years before Eliaphis Levi published his book and who knows how many years before it became seen as an “evil” symbol. As you said, that temple was destroyed because of the failure of the Saints. They didn’t earn the Lord’s protection and their work was wiped out. It’s been rebuilt with a number of other symbols, like stars, suns, moons, an angel, etc. All of which are elements used by witches, pagans, etc. but which existed long before any of them did. 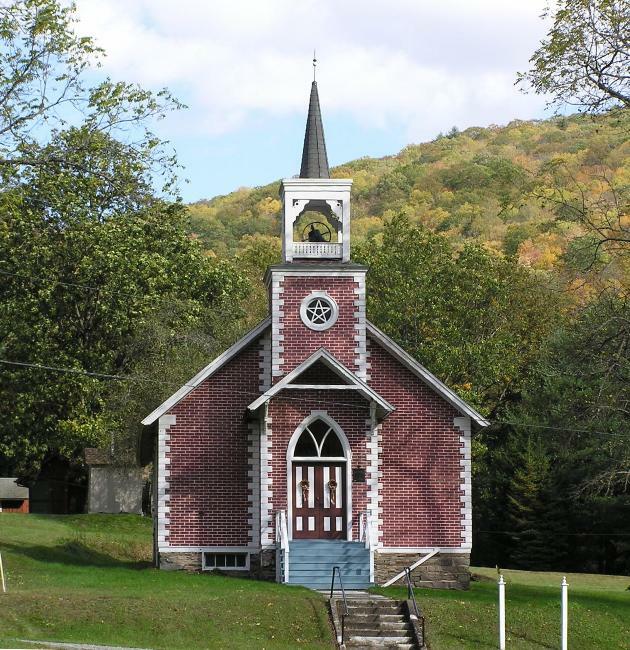 To follow up on my previous comment…”Beware of the man who eventually seats himself inside the Navoo Temple proclaiming to be God” and saying “All is well in Zion”. Those inverted pentagrams are a SIGN of Satan’s Coming to THAT Temple. Those symbols are at the TOP, representing Satan being CAST from Heaven ( inverted positioning), DOWN to Earth, in his final attempt to destroy the works of God. As referring to D&C 112 and God’s Judgments BEGINNING upon His OWN HOUSE….Put all these scriptures & symbols TOGETHER. Where did this rebellion begin in the Preexistence ? In God’s HOUSE ! Did not Joseph Smith say this is but a CONTINUATION of that War that began in God’s House of Heaven , for which a TEMPLE on earth is a SYMBOL of ? Please Wake Up ! Interesting speculation, that’s one way to look at things. It shows how subjective the interpretation of symbols can be and how different people can take away different things. The war began in the generically alluded to “heaven” but I don’t believe I’ve heard it specifically referenced as “God’s House” of heaven. While the temple on earth can certainly been seen as a representation of the pre-earth life and the sanctified version of this world, it can symbolize a number of other things. The Nauvoo temple for instance was designed to represent the church as a bride waiting for the bridegroom, and a temple itself is also a symbol of every human soul, the true temple that God desires to come and abide in. 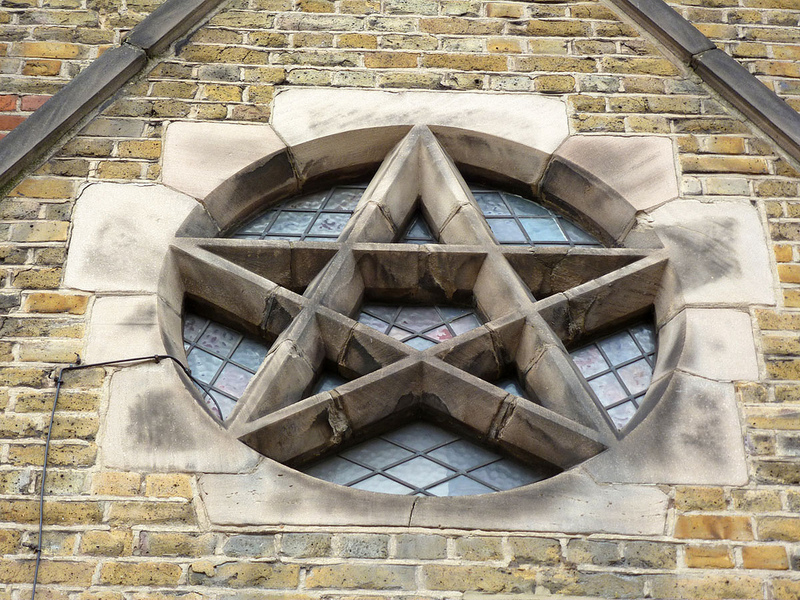 A five pointed inverted star is not in and of itself a bad symbol, as depicted by the symbol on the Temple representing Venus (The Morning Star representing Jesus Christ ). It becomes bad when the inverted star is inscribed within a circle and has a purely occult meaning. It helps to understand the OCCULT meaning of these symbols to see how they oppose the Lord’s meanings of these symbols which are arranged in a different format. 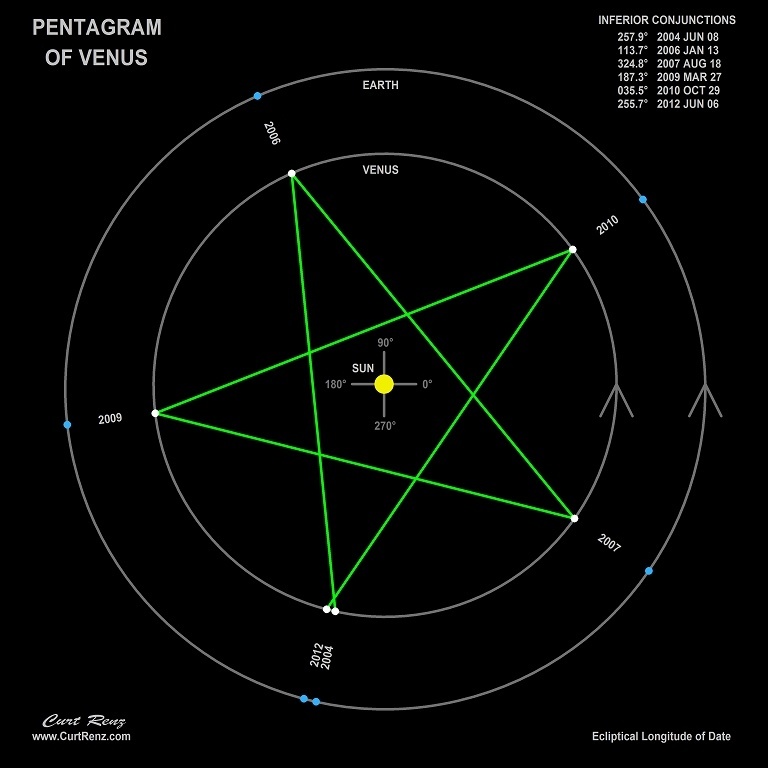 An inverted star ONLY becomes a pentagram (Satan’s symbol of himself representing the “Son of the Morning, Venus), when it is inscribed within a circle. Otherwise, it is only an inverted star and not a pentagram. 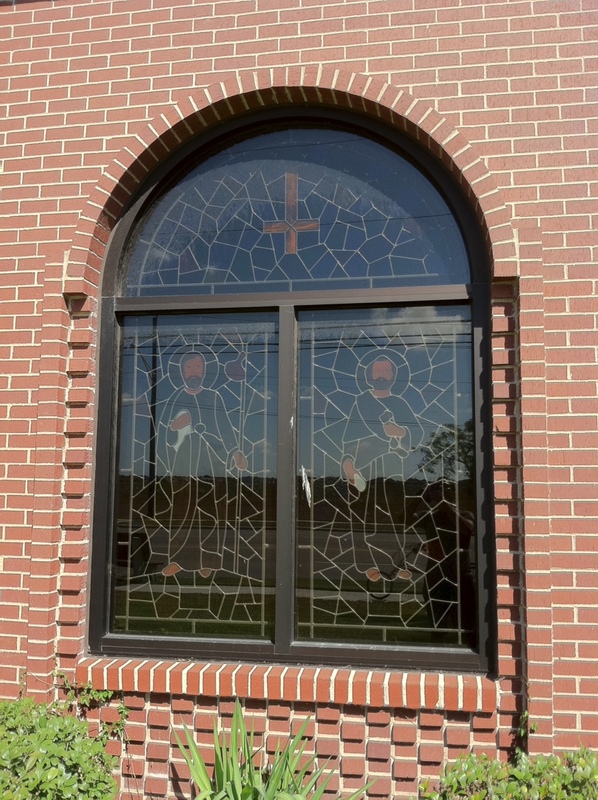 Those star windows ARE inscribed within a circle. The circle infers Satan’s LIMITS & boundaries to his power & authority, rather than an uninscribed five pointed start representing Jesus having NO boundaries or limits to enclose Him. You should study BOTH sides of the symbol equation before assuming ALL those symbols are of God. I’m interested in where exactly these rules are written out, who made them, when, and why these rules are the standard by which we should conduct our reasoning. I’m going off of Alma 30:44 “all things denote there is a God; yea, even the earth, and all things that are upon the face of it, yea, and its motion, yea, and also all the planets which move in their regular form do witness that there is a Supreme Creator.” Attached is the orbit of Venus around the sun and the five conjunctions that happen during 8 earth years. Since all things denote that there is a God, it doesn’t matter to me what the other side has to say. Satan wasn’t mentioned as the morning star get your facts straight. He was in the hebrew bible! Shatan (which means lower ego, not some demon overload on his throne, get this fear mongering hollywood crap out of your head) is hebrew also mentioned in the Quran. The “morning star” had to do with the christian bible. I don’t believe that my post or anyone has mentioned Satan as the “morning star” as you suggest, coupd you clarify what you are referring to? 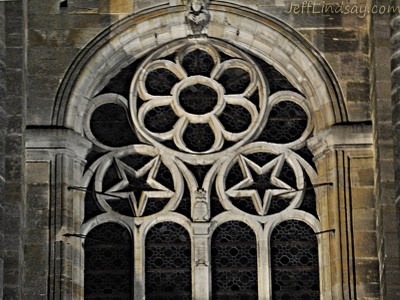 The process used in this blog to justify the use of the star windows in the Temple is what is know in the scholarly realm as “Forcing the Text”, in order to match the author’s bias, rather than letting the text speak for itself. I’d recommend studying the exhaustive work done by Val Brinkerhoff in his two-part volume titled “The Day Star: Reading Sacred Architecture” and Michael Schneider’s book “A Beginner’s Guide to Constructing the Universe” as they have a great deal of information that is worth considering. Nothing in the scholarly realm has actually been referenced, just statements that claim support from said scholarly realm. I’m aware of the history of the symbol, I just disagree that the meaning of a symbol is defined by mortal man instead of God who created all things. I disagree that simple geometry can be claimed and strictly defined by any man, woman, or devil. My premise is that he who owns all is he that created all and that the ultimate authority rests there. If one considers this temple a house of the Lord, then this is the context in which the symbols upon it must be considered. If you do not consider it a house of the Lord, then you will define the symbols in another context. This may surprise you, but I believe that this is fair as well. I do have a bias and I want to make it clear: I believe that this is a house of the Lord and so I interpret the symbols within that context. This is my personal study blog, it doesn’t get much traffic and I do not care. It exists here for me to post a collection of things from my personal study that I choose to share with anyone who may be interested. As I learn new things, I’ll come back and update these posts. Nobody is constrained or required to accept my perspective as I am just a mortal man who is climbing that proverbial mountain along with my fellow-travellers. The book of Genesis tells us that “God” created the earth , planets, stars and sun. He in turn set them in motion. The symbol or shape they make while in motion belongs to the one who created them . Satan who is nothing more then a thief and a liar has stolen this symbol for his own evil use. Does this now mean that he owns it? Genesis does speak not only for itself but also speaks for the God. I’m always glad to see when someone gets it. Just came across this and I like your analysis. I too have been frustrated with the misuse of this holy symbol. When I asked my 15 yr old daughter to create a logo (attached) for my Holy Places iOS app that I released a year ago, she used this symbol from the Nauvoo temple. I have had some suggest that I change it since they are put off by it but I refuse to give into the dark side’s usurping of this celestial symbol. I am with you in restoring this symbol to its proper place! Thanks for sharing, good luck with your app! All I know is (okay not all) is that the Occult considers the upside down pentagram as “the most potent means for conjuring spirits (demons)” That’s good or should I say evil enough for me. BTW, look up what the scriptures say about conjuring spirits-it calls it “an abomination”. Like I mentioned, this symbol was associated with occult practices by some guy in the 1800s. With an Ouija board one can conjure up spirits with the letters of the alphabet. Is the alphabet evil? People can invite evil spirits with their actions, intents, and desires. Inanimate things are not good or evil, they are things. Evil only comes from the intent of conscious beings. God created everything, so he owns everything. Satan did not create circles and stars.